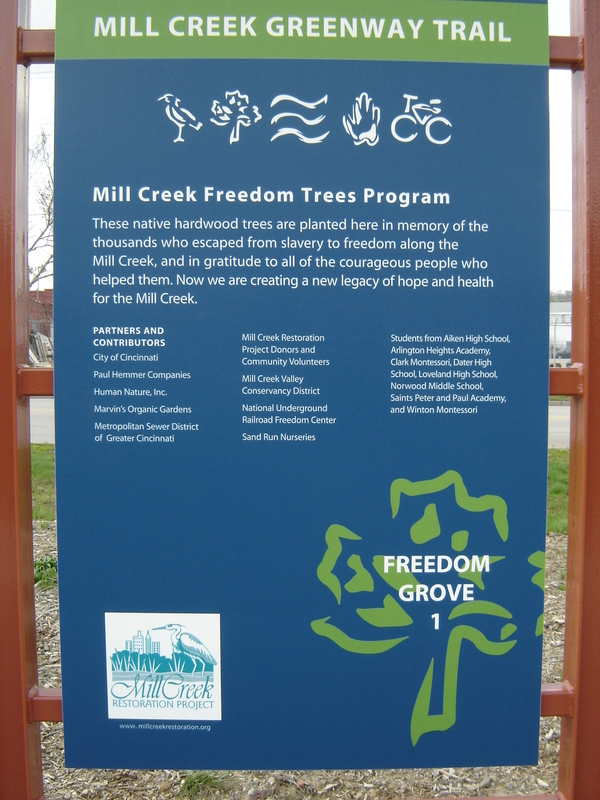 In 2005 the Mill Creek Restoration Project (now Groundwork Cincinnati Mill Creek) planted trees in honor of the place where escaping slaves would exit the Mill Creek and start their trip northward along the wooded ravines following Hamilton Avenue. Creeks and streams were often followed as they provided natural cover, easier travel and the water would disguise their scent should hunting dogs be tracking them. The MRCP partnered with the National Underground Railroad Freedom Center, Paul Hemmer, Sand Run Nursery and the City of Cincinnati on this project. In November of 2005 a 150 trees were planted at this site with the help of students from Dater and Loveland high schools. A press conference and dedication was held with Vice Mayor Alicia Reese, Congressmen Rob Portman and Steve Chabot, Dr. Spencer Crew from the National Underground Railroad Freedom Center and Northside Community Council members in attendance. 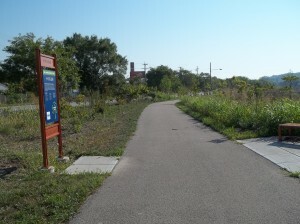 This site is located off William Dooley By-Pass, in Northside, on property owned by the Mill Creek Valley ConservancyDistrict. 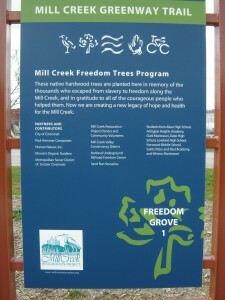 Since 2005 other Freedom Groves have been planted along this route.